On Friday 29th September we hosted our own World’s Biggest Coffee Morning in aid of Macmillan Cancer Support! Mouths were watering with a delicious array of goodies, such as the famous cheese twists, vegan cake, cupcakes, burger pies, and a number of other delicious baked goods! The morning kicked off at 10am in the comfy sofa area of the office, with staff popping in their donations for the tasty treats. Plates were piled high and some went back for seconds, maybe even thirds! All of the bakes were judged for the KSC Bake Off by our very own Prue Leith and Paul Hollywood to crown the KSC Best Baker! On this occasion, with both sweet and savoury entries, 2 winners were crowned. The victorious bakes were the burger pies, and the shortbread swirls. Yummy! 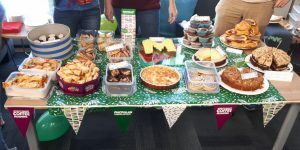 We raised £132.44 for Macmillan and also added a few pounds to our waistlines! A big thank you to everyone who provided cake, purchased cake or both, and well done to our winners!